Sorry, in these days I'm always busy and I can't follow my blog as I want. But now I just want to show you something I recently made for me. Just for me! I usually create bijoux for my shops, fairs, for my friends, or for orders. Sometimes I need to create something for me! Scusatemi, ultimamente le mie giornate sono molto impegnate, e così non posso seguire il blog come vorrei. Ma ora voglio mostrarvi qualcosa che ho fatto recentemente per me. Solo per me! Di solito creo bijoux per i miei negozio online o per i mercatini, per le amiche, o per degli ordini. Ma qualche volta ho bisogno di creare qualcosa anche per me! 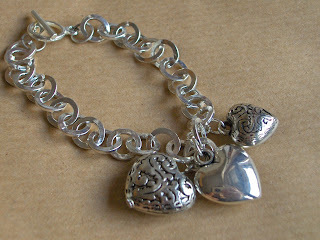 For example, this is a bracelet I made last week, with three heart shaped metal charms. Per esempio, questo è un bracciale che ho fatto la scorsa settimana, con tre charm in metallo a forma di cuore. The following is a "parure" (set) that I made for me for the New's Year Eve party! The pearl blue beads are made of fimo (polymer clay), the other silver plated beads are made of metal. This set was perfect for my dress! 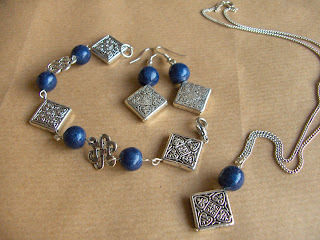 It includes earrings, bracelet and pendant. Questa invece è la parure che ho fatto per capodanno. Le perle blu perlato sono in fimo, ed ho usato anche delle perle in metallo in stile un po' "celtico". Questa parure era perfetta per il mio vestito! Comprendeva bracciale, orecchini e ciondolo. And now, a photo of the S. Anthony's tart my mum cooked last week for the S. Anthony's Day! 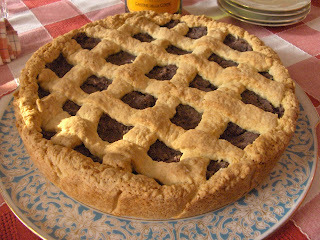 E ora, la foto della crostata di S. Antonio che mia mamma ha cucinato per il giorno di S. Antonio settimana scorsa! Finally, yesterday I found out my new addiction. I was surfing the net, and I discovered the Sylvanian Families. This is a series of collectionable toys with a lot of adorable animal families, with houses, furniture, and a ton of amazing accessories! Having a look in the website I also remembered that as a child I had a character of them! Now I definetely fell in love with this awesome world, and I do want some of characters and furniture. I really suggest to have a look to the website, I'm sure you'll adore them! This is my favourite family (but they are all great!). The photo belongs to Magw21. Questa che segue è la mia famiglia preferita, ma sono tutte bellissime e scegliere è arduo. La foto non è mia ma appartiene a Magw21. E voi? Ve li ricordate? =) Se non li conoscete vi consiglio caldamente di visitare il sito! 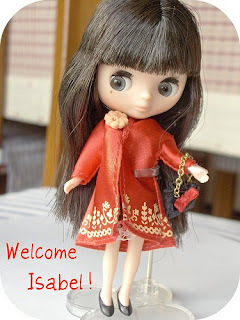 Finally, the little Isabel came to me! 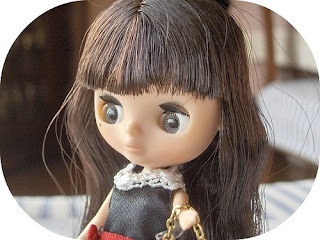 Isabel is a lovely and sweet Petite Blythe (she's Night Flower). I just love her. I'm looking forward to making tons of jewelry for her. 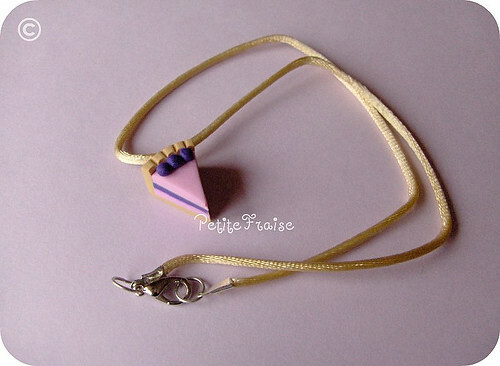 I've never made such tiny jewelry (my Isabel is very small...she's about 11cm), but I'll try! 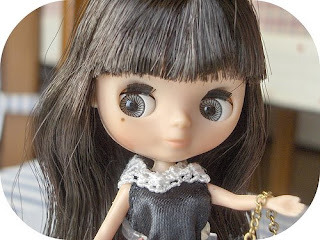 And I can't wait to make a dollshouse, or just a room, for her...but for this task I need time! Oggi sono su di giri. Finalmente, stamattina la piccola Isabel è arrivata da me! 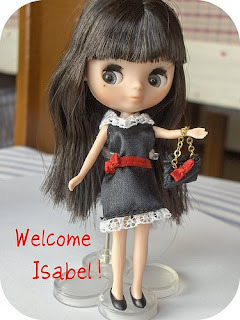 Isabel è una carinissima e dolce Petite Blythe -un tipo di bambole da "collezione" diffusissimo in Giappone e anche nel resto del mondo- (lei è una Night Flower Blythe). La adoro. Non vedo l'ora di fare un sacco di bigiotteria per lei. Non ne ho mai fatta di così piccola (la mia Isabel è proprio piccola...circa 11cm! ), ma proverò! E non vedo l'ora nemmeno di farle una casa, o anche solo una cameretta...ma per questo ci vorrà più tempo! Lo so... sembro una bambina che non cresce mai vero? Che ci posso fare? Amo il mondo della fantasia, delle cose piccole, delle bambole... Sono un'inguaribile sognatrice! Quindi sono molto soddisfatta e felice! Tomorrow, here in Italy we celebrate the S. Antonio's Day. The folk superstition says that if you don't eat the S. Antonio cake, during this year you'll loose your house! For more information contact me at petitefraise@live.it . And if you want, comment me here, it's a pleasure reading your opinions! Se volete ulteriori informazioni, contattatemi pure all'indirizzo e-mail petitefraise@live.it . E commentate pure, mi fa piacere leggere le vostre opinioni! CIC Team, and news for S. Valentine! Sorry for my absence, but on Monday I had an exam, so I was busy with my French books! I've some news for you! Ma ora ho qualche notizia per voi! 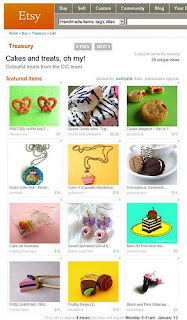 First of all, now I'm part of Crafting in Color Etsy Street Team, and I'm so happy! Thank you for this opportunity! 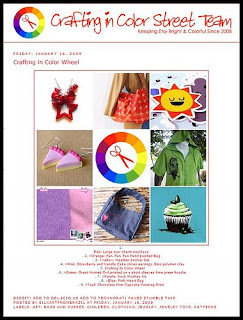 Prima di tutto, ora faccio parte del Crafting in Color Etsy Street Team, e sono felicissima! Grazie a chi mi ha accettato per questa opportunità! Second, I'm taking care of my DaWanda shop. I added some new items there (some have sold in just 3 days!) , so check them out! Today I'll show you some cute creation for S. Valentine's Day (but you can wear them the rest of the year too! Seconda cosa, ultimamente mi sto prendendo cura del mio negozietto DaWanda che negli ultimi mesi avevo un bel po' trascurato. Ho aggiunto molte cosine nuove (alcune sono già state vendute! ), tra cui queste due creazioni che vi mostro oggi, ideate per San Valentino ma perfette anche durante tutto il resto dell'anno! 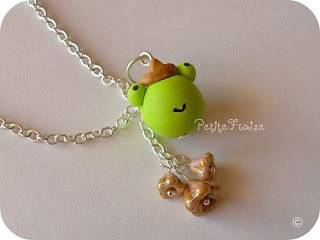 A super romantic necklace with a froggy prince, made of FIMO (polymer clay). The crowned frog is placed on a silver plated chain (nickel free); on the chain I also added some delicate and beautiful opaque rose/gold topaz Czech Glass Bellflowers. Una romantica collanina! Si tratta di una catenella argentata nickel free, sulla quale ho messo un simpatico e dolcissimo principe ranocchio, modellato in fimo. Ho anche aggiunto tre belle perline in czech glass a forma di campanula. It's Tea Time, My Love! Earrings. A cute and romantic pair of earrings! 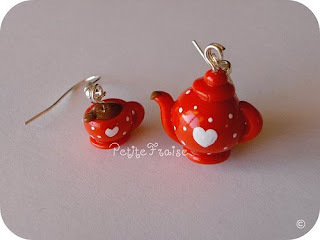 There is a red with white polka dots teaset (a cup of tea and a teapot), made of FIMO (polymer clay), and varnished with a special gloss lacquer for polymer clay after baking. There is also a sweet white heart on both. 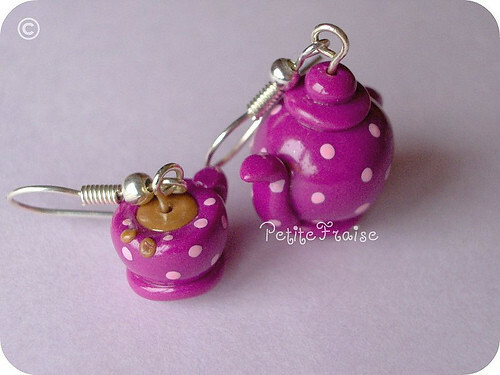 Nuovo paio di orecchini della serie “It’s Tea Time!”. Sono come al solito modellati a mano in fimo, rossi a pois bianchi con un cuore davanti sia sulla tazzina che sulla teiera; lucidati dopo la cottura. You can find both on my DaWanda! Potete trovare entrambe le creazioni sul mio DaWanda! Finally, I'd like to say a huge THANK YOU to Evelyn from Sumiko Shop for featuring me on her blog! I really like her romantic jewelry so go visit her! Infine, vorrei ringraziare tantissimo Evelyn di Sumiko Shop per aver parlato di me sul suo blog! Mi piace molto i suoi gioielli romantici e femminili, quindi andate a trovarla! Merry Epiphany to all of you! Well, I know, Epiphany is not celebrated worldwide... it is an important festivity in Italy, but I don't know where else is celebrated...can someone tell me? 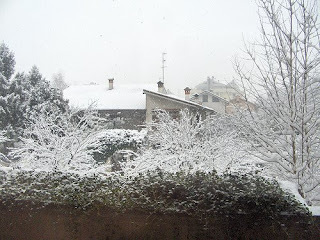 Today when I woke up I found a completely white landscape... I was amazed! 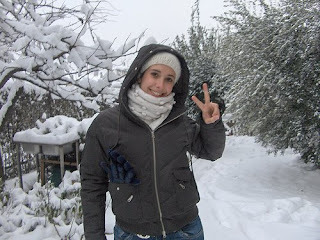 *O* I love snow! Here I show you some funny photos I made today. 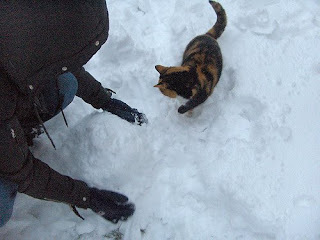 This afternoon my sister and I went out in the garden to play with the snow! Lo so, il giorno della Befana (ma prima di tutto dei Magi che vanno ad adorare il Bambino), non è celebrato in tutto il mondo... qualcuno mi sa dire quali altri Paesi festeggiano il 6 gennaio? Sono molto curiosa! Ora vi mostro qualche foto che ho fatto oggi. 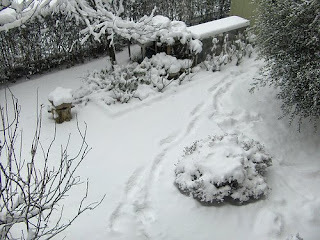 Nel pomeriggio io e mia sorella, invece di studiare come dovremmo, siamo scese in giardino a giocare con la neve! 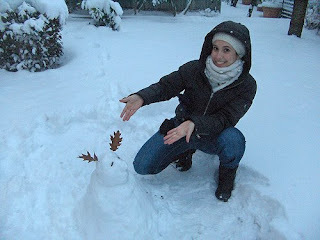 Anche lei vuole aiutarmi con il pupazzo di neve! 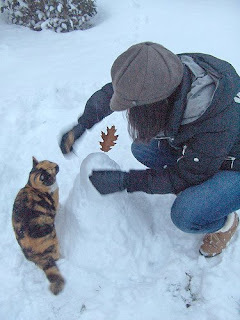 Pallina helps my sister in making the snowman's hair! 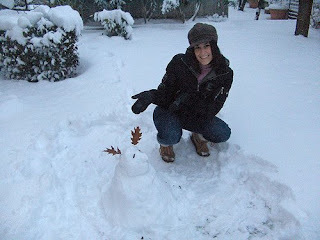 My sister and our -sooo ugly!- snowman! 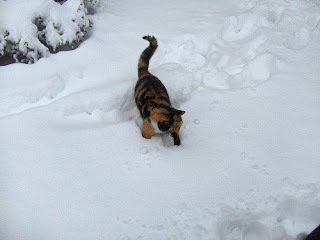 Mia sorella e il nostro bruttissimo pupazzo di neve! Il nostro orrendo pupazzo e me! And know, one of my latest creation. From the "What's the Weather Today?" 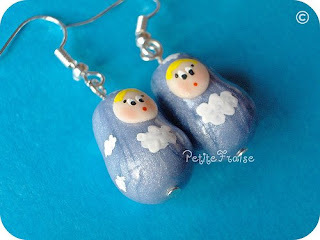 series, this pair of earrings is named "It's a Cloudy Day" with two sweet Matryoshka dolls. They're pearl light-blue Matryoshkas (Russian Dolls); the bodies are made of FIMO (polymer clay); the eyes, the hair, the mouths and the decorations on their bodies (little cute clouds) are handpainted by me with acrylics with love and care! They're varnished with a special gloss lacquer for polymer clay after baking. You can find it in my DaWanda shop! Finally I I remind you that in my Etsy shop the FREE SHIPPING promotion is continuing! This offer will be over on January, 09 so hurry up! Dalla serie delle mie Matryoshke "Che tempo fa? ", orecchini "Giornata Nuvolosa" (ma i titoli rendono meglio in inglese...). 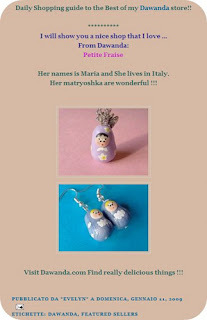 Il corpo delle matryoshke è modellato a mano in fimo; occhi, bocca, capelli e nuvole sul corpo sono dipinti a mano con gli acrilici. Lucidati dopo la cottura! Oggi ho poco tempo ma tante novità! 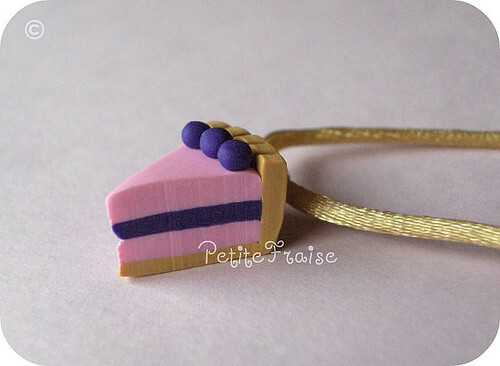 Strawberry and Blueberry Cake Slices Necklace, made of fimo (polymer clay). The entire lenght of the necklace is about 45cm. Unfortunately my camera is not so good, so the blueberry part (the blueberries on the top and the cream in the middle of the slice) seems blue. In reality it is PURPLE. Questa è una collana con charm fetta di torta (alla fragola e al mirtillo) montata su coda di topo color champagne.Quando aperta misura in lunghezza circa 45cm.Purtroppo la mia macchina fotografica è quello che è, e ha reso blu i mirtilli sopra e la parte in mezzo della torta…in realtà è viola! You can find it on my Etsy and on my DaWanda shops! Potete trovarla nei miei negozi Etsy e DaWanda ! 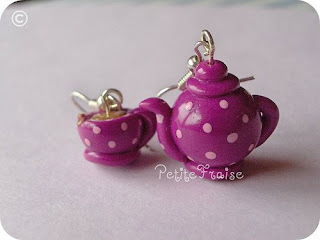 Do you remember my first tea time pair of earrings and this other one? The family has grown up! 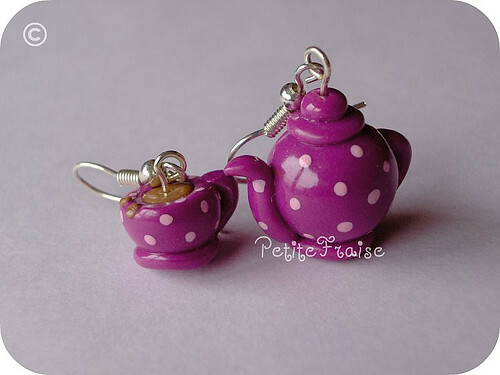 This pair of earrings represents a teapot and a cup of tea, cyclamen-coloured with pink polka dots, made of FIMO (polymer clay) and varnished after baking. Finalmente aggiungo nuovi elementi ai miei servizi da thé, che amo tantissimo fare! Vi ricordate il mio primo paio di orecchini “tea time” e quest’altro? Ecco, la famiglia si allarga! (in realtà, nel frattempo, ne avevo fatti altri per varie ordinazioni ma non li ho fotografati oppure non ho mai avuto il tempo di caricarli).Questo è color ciclamino, con pois rosa chiaro, ed è come al solito lucidato dopo la cottura. You can find it on my Etsy shop! Potete trovarla nel mio negozio Etsy ! This pair of earrings was a Christmas commission for a coffee addicted. 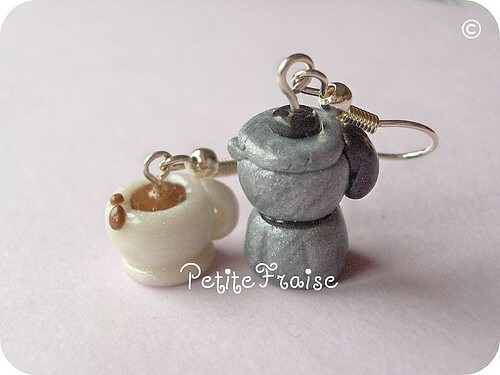 This was a project that I had months ago, but only recently I had the opportunity to realize my idea… Coffeepot with cup of coffe made with fimo (polymer clay) and varnished after baking. Orecchini con moka e tazzina di caffè, in fimo perlato/metallizzato, lucidato dopo la cottura. As soon as possible I'll answer to your comments! Vi ricordo che nel mio negozio Etsy la promozione SPEDIZIONI GRATIS continua! Questa offerta finirà il 09 gennaio, quindi affrettatevi! Vanilla and chocolate cake with cherries earrings...my Etsy promotion continues! 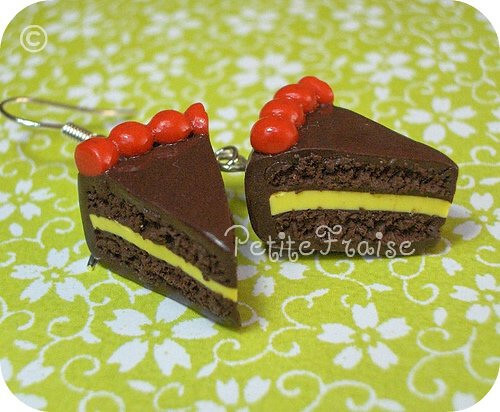 Today I listed a new item in my Etsy shop: this cute "vanilla and chocolate cake slices with cherries" pair of earrings! 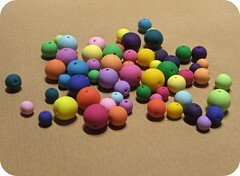 They are made of fimo (polymer clay), and the upper part is varnished after baking. If you are interested in them, you can find them in my Etsy shop (prices in US dollars).For more information contact me at petitefraise@live.it . And if you want, comment me here, it's a pleasure reading your opinions! I remind you that in my Etsy shop the FREE SHIPPING promotion is continuing! This offer will be over on January, 09 so hurry up! Oggi ho inserito nel mio negozio Etsy un nuovo paio di orecchini! Rappresentano due fette di torta alla vaniglia e cioccolato con ciliegie. Sono fatte a mano in fimo, la parte superiore è stata verniciata dopo la cottura. Se siete interessati, potete trovarli nel mio negozietto Etsy (prezzi in dollari americani). Se volete ulteriori informazioni, contattatemi pure all'indirizzo e-mail petitefraise@live.it . E commentate pure, mi fa piacere leggere le vostre opinioni! Happy New Year my friends!!! How did you spend your New Year's Eve? I had much fun with my boyfriend and a couple of friends! Just a very fast message to let you know what I'm offering in my Etsy shop! To celebrate the new year I'm having a great PROMOTION for you!!! I'm offering you ***FREE SHIPPING*** worldwide ONLY for the FIRST week of 2009: FROM JANUARY 02 TO JANUARY 09!!! This is a great offer! I hope you'll enjoy it! Note that in this very moment my Etsy shop is closed, I'll re-open it tomorrow! Buon anno nuovo a tutti amici miei! Come avete trascorso la notte di capodanno? Io l'ho passato con il mio moroso e una coppia di amici, e siamo stati proprio bene! Abbiamo magnato tantissimo (ma proprio tanto, da non avere parole!) in un agriturismo vicino a Pavia! 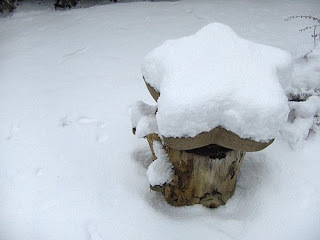 Tutto buonissimo... e ha anche nevicato, ne è venuta giù di neve... tanto che, essendo l'agriturismo sperso tra i colli (per raggiungerlo abbiamo percorso stradine sterrate e strette, quasi nei boschi! ), avevamo paura di non riuscire a tornare indietro (non avevamo neppure le catene...). Vi lascio un messaggio velocissimo -sono davvero stanca, con un filo di febbre, ho freddissimo e non vedo l'ora d'infilarmi al calduccio sotto il piumone- solo per informarvi della favolosa promozione che vi propongo nel mio negozietto Etsy! Per festeggiare il nuovo anno, vi offro la SPEDIZIONE GRATIS in tutto il mondo SOLO durante la PRIMA SETTIMANA del 2009: dal 2 al 9 gennaio!!! NB: in questo momento il mio negozio Etsy è ancora chiuso per ferie, riaprirà domani! E con questo...passo e chiudo!